There are dozens of emails to read and reply to, projects to resume, and colleagues to check with. To plan for this scene, block off catch-up time in your calendar. 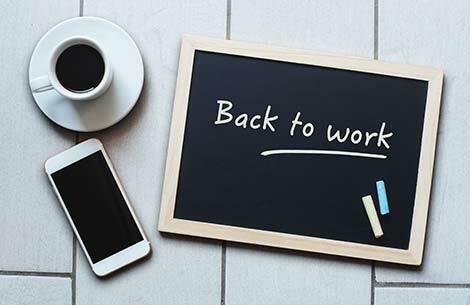 To give yourself breathing room, let supervisors, co-workers, and clients know that you are back and will be available after your catch-up date. Segue back into work by completing specific tasks rather than big abstract projects. Outline a "to-do" list with specific actionable tasks (10 or less). Use verbs such as "write" "study" or "buy." Setting daily goals and splitting up large and daunting tasks into smaller ones works hand-in-hand with good planning. Assign yourself one daily goal related to a core work priority. Setting a key goal for each day enables you to focus on the goal. Another benefit of breaking up a larger task into smaller ones, makes the larger task seem more conquerable — like taking small steps up the side of a huge mountain. Each small step, taken on its own, seems doable, while trying to summit the peak can seem incredibly daunting. Breaking up a larger task into smaller tasks also gives you a sense of micro-accomplishment as you cross things off your list. Don’t discount the motivating power of these small victories. Don't let your inbox tell you what to do. Prioritize your goals over others' requests. Because time is limitless and highly personal, we can go within to establish a comfortable range of rhythms and balance. An ancient Chinese Taoist philosophy, described in The Tao of Time: A Revolutionary Philosophy and Guide for Personal Time Management, offers ideas that are consistent with current scientific views. 1. Nonresistance teaches us to let go of our prepackaged approach to time management and allow events to unfold. 2. Individual power enables us to assert our right to control our time. Trusting our intuition enables us to remove extraneous details that cloud our vision. We enhance clarity, confidence and efficiency. A challenging situation now seems effortless. 3. Balance suggests attending to our intuition help us live in the moment and balance activities. 4. Harmony. This concept suggests synchronized our environments. Centered, we don’t feel guilty about past actions or fear future choices. As we become comfortable with the foregoing concepts and rediscover our natural rhythms, clocks and schedules can be used as tools rather than absolutes. Can you find a balance between the holistic and linear ways of perceiving time? How can you integrate these concepts into your management of time? When you’re away from usual lines of communication for an extended period, like the holidays, set a proper auto-reply system. A good message strikes a nice tone, informs callers or emailers the dates you will be unavailable, when they can expect to hear back from you, and a contact person to reach for immediate assistance in your absence. Keeping on top of your work is critical, but preparing for uncertainties is also important. Look for new job opportunities with your current employer, a similar organization, a different industry, or consider taking a course to upgrade your current job skill set or prepare for another job, industry, or self employment. Continue to update your resume as you gain new experiences and learn about new developments in your current or desired fields. Develop a different resume for each job target. Make certain that your resume reflects a clear job objective, summary statement, and focuses on your accomplishments -- what you achieved in previous positions that made a difference. In addition, develop a career portfolio that demonstrates what you can offer a potential employer, business investor, or new client. Portfolios provide considerably more information than a cover letter and resume alone. Career portfolios use words and pictures, as well as an array of multi-media formats. A portfolio is limited only by one’s imagination. A portfolio includes work samples that show your qualifications and skills as well as relevant education and volunteer activities. It documents the scope and quality of your experience and training. Your portfolio demonstrates what you’ve accomplished and can offer the employer. Take your portfolio to job interviews to show what you can contribute to the prospective position. - Enhance your network. Keep abreast of new developments in your field, and add to your list of colleagues and acquaintances by joining professional, trade or civic groups. - Take charge. Start the year strong and take advantage of new opportunities that present themselves. If you want a new job, don’t passively answer help-wanted advertisements or send out resumes to personnel departments. Find out who the hiring managers are in the departments at companies you’ like to work to determine jobs available and skills required. Then, if appropriate, revise your resume to fit their skill sets. Request interviews, Follow-up communications. Author Bio: Carole Kanchier, PhD, is an internationally recognized newspaper/digital columnist, career coach, psychologist and author of the award-winning, Questers Dare to Change Your Job and Life and the forthcoming Arouse the Force WithinYou! Dr. Kanchier has taught at University of California, Berkeley and Santa Cruz and University of Alberta, and served as visiting fellow at Institute of Transpersonal Psychology, Palo Alto, and other institutions of higher learning. Dr. Kanchier is known for her pioneering, interdisciplinary approach to human potential.